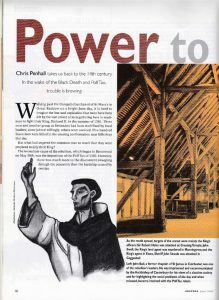 Chris Penhall takes us back to the 14th century. In the wake of the Black Death and Poll Tax, trouble is brewing. Walking past the tranquil churchyard of St Mary’s in Great Baddow on a bright June day, it is hard to imagine the fear and trepidation that must have been felt by the vast crowd of men gathering here in readi­ness to fight their King, Richard II, in the summer of 1381. These men and another group at Rettenden had been mobilised by local leaders; some joined willingly, others were coerced. Five hundred Essex men were killed in the ensuing confrontation near Billericay that day. But what had angered the common man so much that they were prepared to defy their King? through the peasantry than the hardship caused by one tax. As the revolt spread, targets of the unrest were mainly the King’s oficers: Sir Robert Hales was attacked at Cressing Temple; John Ewell, the King’s land agent was murdered in Manningtree; and the King’s agent in Essex, Sheriff John Sewale was attacked in Coggeshall. The arrival of the Black Death in Essex in 1349 pµt social and economic pressure on the feudal system, under which agricultural workers had been tied to a manor and paid their Lord services for tenure of their own land. In many areas this was evolving into a system whereby the Lord rented out his land, rather that worked it through his villeins: these yeomen farmers employed labourers themselves and were becoming more prosperous and independent. Further outbreaks in 1361, 1362 and 1369, however, wiped out a third of the population of England, leading to a shortage of labour, a rise in wages and attempts by the Lords to reinforce their power. The Statute of Labourers in 1359 set maximum pay rates, reasserted the claims on service to manorial Lords and ordered the return to their manors of runaway serfs, measures which fueled tensions and resent­ment in the countryside. The government was also distrusted: in 1376 and 1377 leaders of the administration were impeached for corruption but were not punished and the increasingly unsuccessful war with France was proving expensive. In order to raise money, the burden of taxation increased until the propertied classes who dominated parliament and paid the most in taxes became more reluctant to provide money for unsuccessful foreign policies. Therefore a new form of taxation was found. The first Poll Tax, or Head Tax, which would affect everyone was imposed, then a second in 1377 and a third at a rate three times higher than that of 1377 in 1380. This last tax provoked widespread fraud and evasion, often with the complicity of local officials who sympathised with the common man. The government, aware of this, instituted a new body of commissioners who had the power to compel payment from any evaders and imprison anyone who resisted their authority. Add to this large numbers of disaffected soldiers returning from the foreign wars, widespread disillusion with the hierarchy of the church, many of whose leaders were involved in govern ment and the spread of social debate brought by wandering preachers – including one of the rebellion’s leaders, John Ball – unrest was inevitable. The incident that sparked the revolt occurred when the tax commissioner, Thomas Brampton, went to Brentwood on 30th May, having ordered the headmen of the villages of Stanford-le-Hope, Corringham and Fobbing to appear before him as they had withheld payment of the tax. Brampton and his assistants were attacked and driven from the town by the aggrieved villagers of Fobbing. Consequent y, Sir Robert Be llknap, Chief Justice to the Common Pleas went to Brentwood on 2nd June with 20 soldiers to punish the rioters. A much larger crowd awaited them and three of his clerks and three local jurors were murdered, their heads carried on poles around the town and neighbouring villages. The revolt had begun and spread rapidly throughout the county and beyond. The targets of unrest were mainly the King’s officers and the bureaucracy of tax gathering: amongst the victims were the King’s agent in Essex, Sheriff John Sewale, who was attacked in Coggeshall, as was the estate of the King’s treasurer, Sir Robert Hales, at Cressing Temple. John Ewell, the King’s land agent in Essex was murdered in Manningtree and his documents were destroyed. At the same time, the rebellion spread to Kent, where the leaders that are familiar to us today came to the fore – Wat Tyler, Jack Straw and the Essex preacher, John Ball. Ball, a former chaplain of St James in Colchester, became involved when the rebels released him from the Archbishop’s prison in Maidstone. Born in Peldon, he was one of many wandering preachers who talked of social prob­lems. His avocations of a classless society were perceived as such a threat that successive Archbishops of Canterbury imprisoned and excommunicated him, forbidding him to preach. Undeterred, he travelled wherever he could find an audience and was in Maidstone for preaching in the Diocese of Archbishop Simon of Sudbury. The Essex and Kent rebels then headed for London, believing only a direct plea to the King would ensure their aims would be met. They did not hold the King responsible for their ills – reserving their hatred for his advisers, particularly John of Gaunt fighting under the slogan, “With King Richard and the True Commons “. At Mile End, King Richard agreed to their preliminary demands: common justice for everyone, freedom from serfdom, freedom to trade and cheap land ordering his clerks to draw up charters bestowing freedom and amnesty for all. Many rebels, including most of the Essex men, left having received these, unaware they had no value until ratified by parliament. The men from Kent, however, led by Ball, Tyler and Straw, remained in London, suspicious as to the validity of the promises. The revolt once again erupted into violence and destruction: Archbishop Sudbury, and three others were murdered in the Tower of London, John of Gaunt’s Palace of Savoy, was ransacked and many people connected with tax gathering, such as lawyers and jurymen, were killed. The 14 year old King, meanwhile, whose closest advisers were away dealing with foreign campaigns, and with only a small fighting force, agreed to meet the rebels again, at Smithfield on June 15th. It was here that the revolt suddenly crumbled – Wat Tyler, who had come forward to present the rebels’ further demands, became involved in an argument with a nobleman, and was cut down by Mayor Walworth. In the ensuing confusion, no rebel stepped in to take the lead, enabling King Richard to gain control. He successfully persuaded the crowd to follow him to Clerkenwell, where he was joined by his troops. The rebels dispersed. Any hopes that feudal life would change were dashed by the severity of the King’s response to the rebellion . On June 18th, he and a force of 10,000 men marched to Waltham. He told a deputation of rebels who asked for a ratification of the promises made at Mile End: “Villeins ye are still and villeins ye shall remain.” A proclamation was issued empowering sheriffs, mayors and bailiffs to disperse and arrest trouble makers anywhere in the country, for sporadic out­ breaks of trouble had occurred in other parts of England. However, not all the Essex rebels were prepared to give up, which is why hundreds of men gathered at Great Baddow and Rettenden. They were, inevitably, no match for the King ‘s army at Billericay. Those who survived that fight headed towards Colchester, led by John Ball in an unsuccessful attempt to stir up fresh resistance, they then tried Sudbury but were dispersed. John Ball himself was arrested in Coventry, and was executed in St Albans on July 15th. From the 1st – 6th July the King was in Chelmsford, revoking all charters issued at Mile End and setting up an assize to deal with the captured rebels. Mercy was granted to those in Essex involved in the rebellion if they handed over their leaders to justice. The names of 145 ringleaders were presented. Traitors were condemned to death. On moving to Colchester, King Richard set up an assize under Sir Robert Tresillian, known as the Blood Assize as so many men were sentenced to hang that there was a shortage of gibbets in the town. Any outbreaks that had erupted in other parts of the country were swiftly put down; by the end of the year England was back to normal. As a social revolution, the rebellion failed but succeeded in one main respect: there were no more attempts at levying a Poll Tax until the reign of Henry VIII. Despite the gap of centuries, we still debate and question how much tax we pay and where it goes. For all the jokes, it is interesting to note that Essex men started the first great popular revolt in English history.